Add glitz to decorations and home accessories with a can of spray paint. Choose silver for a cool classy look or gold for a gleaming traditional effect. Select a glittery finish, classic colors, faux stone or an antique finish for other artistic options. 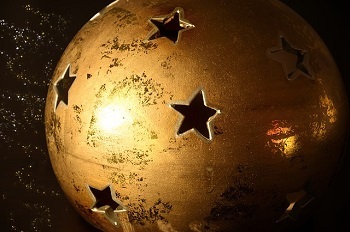 With a simple can of shiny silver, gold or glittery spray paint you can transform even the most humble objects into fancy home decorations for the holidays or every day decor. The new spray paints available offer textures and special finishes that mimic verdiris, rust or stone faux paint effects that used to take many days to complete. Today's paints are also formulated to coat plastics, too, so you can recycle faded and worn items or upcycle plastic containers into fancy one-of-a-kind home or garden decor pieces. Try these budget-friendly creative spray paint crafts ideas to make your own designer home decorations on a budget. Pine Cones - spray clean dry pine cones lightly with white or gold paint and immediatly sprinkle a bit of glitter over the cones. To make cones easier to paint, wrap floral wire around the bases and hang from a stick or push the ends of the wire into a block of foam or a cardboard box. Arrange a pile of decorated cones in baskets or clear vases with mini lights, or attach a ribbon and greens to small clusters and hang from door handles and in doorways. Flowers, dried or artificial - tired flowers get renewed beauty with a light coat of spray paint. Separate bush stems to paint; hang from a rod or lay out individually and turn as you spray. A dusting of glitter sprinkled onto the wet paint is also nice on artificial flowers. Small twigs or tree branches - spray a tree branch with brown, white or any gilding color, then wrap it with a small string of party lights that matches the branch color. Suspend from a window or door frame, lay on a mantle or stand in a corner. Spray a twiggy branch or small tree with white paint. Mount it in a tree stand and use it to hold small ornaments, cookie cutters, jewelry or greeting cards. Use small wired together twig bunches to make tiny versions of these trees and place in baskets, vases and small flower pots, or hang from trees and garlands with ribbon ties. Sea Shells - clean thoroughly, dry and then add a light misting of gold paint to turn your shells into royal baubles. Arrange on a mantel, in a shadow box, or pile casually in an large glass decanter, pitcher or bowl. Intertwine a small string of white-wire battery-operated seed lights or mini-lights to create a mood lighting fixture for the tabletop or mantel. Dried seed pods and nuts take a bit more effort to paint. Hot glue or wrap floral wire to each one, then spray paint or coat with clear finish. Use as decorations in floral arrangements or attach to swags and wreaths. Work outdoors if possible; if you work inside, a well ventilated garage or shed without any source of flames or electrical heat is acceptable. If working in the home with spray paint, choose a room that has no space heaters or sources of high heat, sparks or flames from appliances such as water heaters, stoves or radiators. Protect the area where you work with plastic drop cloths, newspapers or cardboard. Displose of these in the trash after they're completely dry. To keep overspray and waste to a minimum when spraying small objects, use a large cardboard box with one side open to create a spray booth. It's a good idea to wear a ventilator or face mask and disposable rubber gloves to protect your health when using spray paint. The mask is especially important when you work indoors or in a garage or shed. Keep newly painted items away from all sources of heat or combustion until they have dried for several days and are no longer tacky and don't have a paint odor. Keep children away from your painting area and away from wet painted objects until they're completey dry. Don't let toddlers handle or chew on any items you've painted. Spray painted items should not be used with food or as food containers. Ornaments and tree decorations - if you've got some old glass or paper mache ornaments with fading paint or in hues that don't match your color scheme give them a new look with spray paint. Use gold, silver, white or a color that matches your decor. 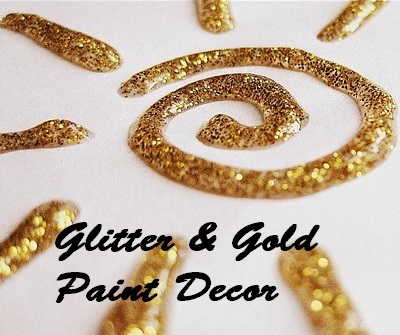 Sprinkle lightly with glitter while paint is wet, or add glitter designs using glitter glue or spot glue and shake-on glitter after paint has dried for several days. To make painting ornaments easier, hang them from a line, rod or rack, or try using a tree branch or fend wire suspended between two chairs or saw horses. Artificial Greens and Trees get a designer look from a light coat of spray paint. Clean thoroughly before painting to remove lose needles and dust. Don't try to coat the entire piece, just go for a lightly dusted effect all over the tree or at the tips of branches. Salt Dough Decorations - make a batch of home made salt dough then cut into holiday shapes using cookie cutters. After dough decorations are completely dry, paint and embellish to create single ornaments or hang groups of ornaments from swags and garlands. Pasta and dried beans - I remember these as classic childrens' arts and crafts holiday decorations. Have kids glue pasta shapes onto a sturdy flat holiday backing cut into a holiday shape - tree, wreath, bell, star or snowman - from a corrugated box. Flower pots, planters and vases - spray clay or plastic pots with your choice of paint to give them a new look. Use the new stone finishes on plastic or glazed pots to create faux pottery. Recycled containers - small cartons, jars, bowls, buckets and non-plastic containers take paint well and are instantly transformed into elegant gift boxes or display pieces with a coat of white, gold or silver paint. Even a humble plastic flower pot becomes beautiful with a coat of paint. Baskets and Boxes that are getting worn and old will look fresh and new after a coat of spray paint in any color, or a misting of clear spray finish. Be sure to clean thoroughly before painting to remove dust and dirt. After painting, tie on a colorful ribbon or add a raffia wrap around the edge, then fill with greens, pine cones, shells or dried flowers. Frames and Mirrors - turn a set of mismatched picture frames into a gallery collection by spray painting them in the same color. Remove glass before painting, and sand lightly if old finish is very glossy. Convert a wooden mirror frame to a golden treasure - mask off the glass carefully with painter's tape and newspaper before spraying. Trim off an drips from the glass with a paint scraper or razor blade.